How? To start with the roots of perennial grasses, like the Switchgrass above, often account for up to 80 percent of total plant weight. These thrifty perennials, with their long roots hold on to soil, water, and fertilizer means less of all types of pollution including carbon pollution of the atmosphere. Every year, healthy soil absorbs and converts atmospheric carbon into biomass. The annual grains that government subsidized corporate agriculture grows on what was once the tall grass prairie create many problems including the run off of chemical fertilizers and pesticides into our watersheds, the consumption of huge quantities of fossil fuel products, the overuse of our limited fresh water resources and the direct emission of billions of tons of carbon that was once safely sequestered in the living soil's biomass but now resides in our common atmosphere. "There is no limit to the quantity of biomass that can be stored in topsoil." says Princeton's Freeman Dyson. Adding, "Biomass means living creatures, plants and microbes and animals, and the organic materials that are left behind when the creatures die and decay. If all the carbon that we are emitting by burning fossil fuels were absorbed by perennial plants . the average increase in thickness of the topsoil is one hundredth of an inch per year." UN Food and Agriculture Organization says, "Atmospheric concentrations of carbon dioxide can be lowered by taking carbon dioxide out of the atmosphere and storing in terrestrial, oceanic, or freshwater aquatic ecosystems. The long-term conversion of grassland and forestland to cropland (and grazing lands) has resulted in historic losses of soil carbon worldwide but there is a major potential for increasing soil carbon through restoration of degraded soils and widespread adoption of soil conservation practices." Another source - The Grasslands of the US - is an excellent natural history study of the N. American grassland's biology, above and below ground. 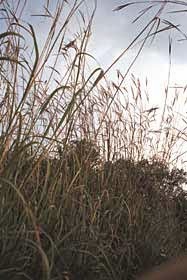 The tall grass prairie gets its name from the upright bluestems (Andropogon spp. shown left ) that reach heights of 6 feet or more by late summer. Their roots may extend to depths of 9 feet or more, binding the soil and enriching it with organic matter as roots die back at the end of the growing season, sequestering and conserving nearly all of the below ground carbon to biomass. The above-ground parts of the plants also die down in winter and though most of the abovre ground carbon is retuned to the atmosphere, about 1/4 is converted to humus by bacterial action. Soil is a living organism, dirt is what corporate ag, turns it into. Perennial plants out compete annual plants due to the development of larger root systems which can access water and soil nutrients deeper in the soil and to earlier emergence in the spring. Consequently corporate ag, along with the bankers and billionaies 'best practices' policies, always calls perennials weeds and demands eradication by any means necessary as part of capitalism's war on the wild. Of course i know this is all a pipe dream, know only to well that we live in a world dominated by money not real wealth, but it gives me solace to research and learn that the Great Mother abides, that the biosphere which didn't notice our arrival, won't notice our passing either. We could be an ongoing partner in creation if, as Naomi Klein says, "We are really in a spiritual crisis. The idea of humans having a divine right to dominate the earth and being outside the community of living things and living systems is at the heart of the crisis.” Adding, "It does necessitate a new understanding — or an older understanding — of our role in the world. 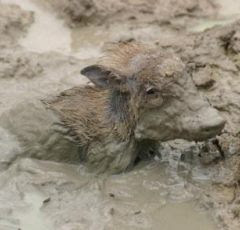 One that says, no, we were never free from nature, nor should we be." Without this spiritual revolution no other changes matter to our human destiny. Might as well dance eh!